Who checks their email on a holiday? Just about everyone, it turns out. 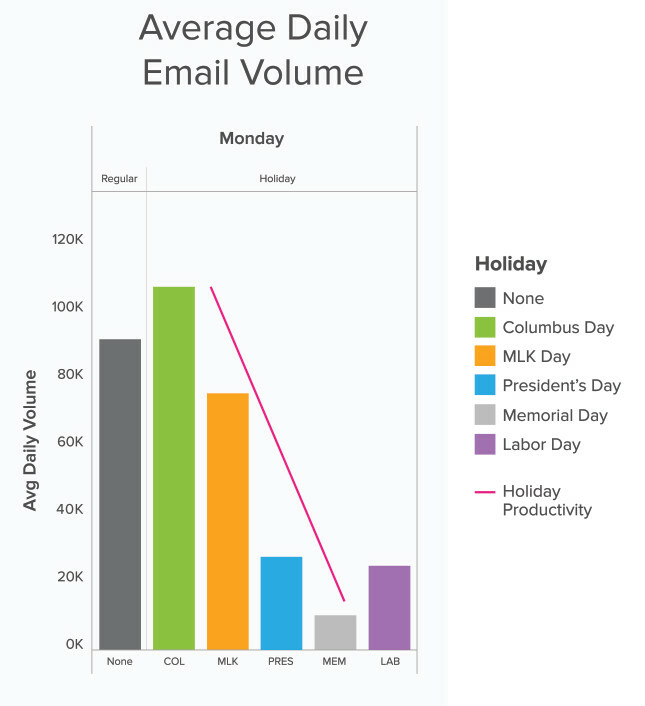 According to our analysis of over 23 million sales emails sent by Yesware users over the course of a year, email open rates on U.S. federal holidays — Martin Luther King Jr. Day, President’s Day, Memorial Day, Labor Day, and Columbus/Indigenous Peoples’ Day — are surprisingly similar to any other Monday. Want more data-back tips to increase your email reply rates? Check out our ebook. With President’s Day approaching, we dug into Yesware’s database to see how these holiday weekends can impact email habits and responsiveness to incoming messages. The biggest takeaway: Not all three-day weekends should be treated as equal — especially if you want to get more replies to your emails. If you want to get your email open and replied to, send it on the Thursday or Friday before President’s Day. While Yesware’s data shows that people send roughly 44% fewer emails on the Thursday and Friday before President’s Day weekend compared to an average week, email reply rates on those days are actually higher than usual. This makes sense, given what we know about inbox competition. When there are fewer other emails, your messages are more likely to stand out. Recipients are also more likely to open and reply to email on President’s Day than on a regular Monday (or any other holiday, for that matter). We found that salespeople send more emails on Columbus/Indigenous Peoples’ Day than a normal Monday. This was by far the busiest holiday, with salespeople actually sending more emails on October 8th than regular mondays in the year. Now, compare that to the volume of emails sent on holidays that follow throughout the year: 1) MLK Day, 2) President’s Day, 3) Memorial Day, and 4) Labor Day. It becomes significantly harder to connect with anyone over email around Memorial Day and Labor Day. On average, users took about 50 minutes longer than usual to open and respond to emails. People send 40% fewer emails on a holiday Monday than on regular Mondays. 5% fewer emails are opened during the weekend before a holiday. But that doesn’t mean workers are unplugging entirely. As the first graphic in this post illustrates, people are checking email on holidays nearly as much as they would during a normal workday. What’s going on here? It could be due to a something thing scientists refer to as the dopamine-loop. Our brains are hardwired to appreciate and seek out novelty — and that includes new emails. Dr. Emrah Düzel, UCL Institute of Cognitive Neuroscience, explains how it works. It’s kind of like playing a slot machine. We never know when we’ll get a satisfying email, so we keep checking again and again, seeking that rewarding “hit.” This also explains why we might take time on holidays to check for new email, only to ignore it once it arrives. The week surrounding President’s Day weekend is an email sweetspot. Reach out on the Thursday or Friday before to increase your chances of getting a reply. Columbus/Indigenous Peoples’ Day is a working day. It may be harder to get a reply, so be sure to follow-up if necessary. Don’t stress if you don’t hear back right away. Any holiday email opens you see are more likely compulsive than action-oriented, especially on Memorial Day and Labor Day weekends. Schedule a reminder to follow-up on Tuesday.